There are several different types of dogs that help individuals with post traumatic stress (PTS)... therapy dogs, emotional support dogs, service dogs, PTS dogs and even pet dogs. A pet dog can offer huge benefits too. Even if you don't have a dog, you could volunteer at a shelter or other animal entity to get a feel for how your interaction with a dog can help your symptoms. ​​DO I NEED TO REGISTER OR CERTIFY MY PTSD DOG? According to the ADA certifications of any type are not needed. However, many programs provide them to their service dog teams. If you are questioned by a business owner regarding the legitimacy of your service dog, the certification shows you and the dog were professionally trained by that specific program. Beware of online companies that try to sell you a service dog certification without ever evaluating your dog in person. Since certification isn’t mandatory, these companies are just out to make a buck.ER OR CERTIFY MY PTSD DOG? ​AM I SURE I NEED A SERVICE DOG? ​​There has been a great deal of media, word of mouth, and other news about how much service dogs can help PTSD. Because of that, many service members and veterans are making spontaneous decisions to get one. But, it may be too soon in your recovery process to bring another life that you’re responsible for into the mix. You might want to give some of your other treatment modalities a chance to work before making a commitment to get a dog. ​HOW CAN A SERVICE DOG MAKE A DIFFERENCE IN MY LIFE? ​Really put some thought into this. Be realistic. Make sure your expectations are reasonable. Ask yourself if you could get the same results from a family member or other treatment modality. Just because you’ve seen other veterans with a service dog doesn’t mean you will get the same results. All teams are different. All dogs are different. All individuals are different. Write out a list of what you’re hoping the dog can do for you, and share it with the programs you apply to. They need to know your expectations, and you need to know if they can be fulfilled by one of their dogs. ​IS IT TOO EARLY IN MY RECOVERY PROCESS TO GET A SERVICE DOG? ​AM I READY FOR POTENTIAL AWKWARD ENCOUNTERS IN PUBLIC WITH MY SERVICE DOG? There are things that can happen when taking a service dog in public places that may make you uncomfortable. Sometimes business owners aren’t educated about public access laws and may try to keep you from entering. Kids may run up and want to pet your dog. People may ask you inappropriate questions. A dog makes you more noticeable, so ask yourself if you’re ready for the attention a dog can bring to you. CAN I TRAIN A SERVICE DOG MYSELF? ​From a legal stand point, you can. But it can be a risky proposition because you’ll be putting thousands of hours of training into it, and the dog may still not be appropriate. You also have to ask yourself if you have the skills to train a service dog correctly. Or what will you do if your dog ends up with a medical problem. It’s hard to be objective about your own dog, so you may miss signs the dog gives you which clearly indicate he doesn’t want to be a service dog. Many dogs prefer to just stay home, rather than handle the stress of working out in public all the time. If you still decide to train your own dog for service dog work, don’t do it alone. Seek out the help of an experienced, credentialed service dog trainer. They should have a background in training dogs for psychiatric-specific tasks, and be well versed in public access testing. ​​CAN ANY DOG BECOME A SERVICE DOG? ​WHAT TASKS CAN A SERVICE DOG DO? ​​Service dogs are taught many different tasks depending on the disability. Most programs will ascertain what tasks you need the dog to perform based on your application. They should be able to train specific tasks based on your individual needs. Some tasks dogs are trained to perform for PTSD include, waking you up from nightmares, alert to oncoming anxiety attacks, retrieve medications, interrupt panic attacks. Some programs train tasks like “watch my back”, or go into a dark room to ensure it’s safe, or keep people at a distance. Other programs believe these tasks don’t really aid in the veteran’s recovery, and only act as a crutch. They prefer that the veteran teach the dog that the world is safe, not vice versa. ​To continue reading the FAQ's, go to "So you want a PTSD service dog: important factors to consider before getting one". Service dogs are protected by both Federal and State Laws. According to the Department of Justice, Americans with Disabilities Act (ADA) a service animal is defined as any DOG that is individually trained to do work or perform tasks for the benefit of an individual with a disability, including a physical, sensory, psychiatric, intellectual or other mental disability. The work or tasks performed by the dog must mitigate and be directly related to the handler’s disability. Examples of such work or tasks include guiding people who are blind, alerting people who are deaf, pulling a wheelchair, alerting and protecting a person who is having a seizure, reminding a person with mental illness to take prescribed medications, redirecting a person with Post Traumatic Stress Disorder (PTSD) during an anxiety attack, alerting to an oncoming anxiety attack for those with PTSD or a myriad of other tasks which are outlined at http://www.iaadp.org/tasks.html. In March, 2011, revisions to the ADA excluded all animals but dogs (and miniature horses in special provisions) as service animals. A service dog is a working animal, not a pet. They have legally defined public access rights, which means they are allowed to accompany their disabled handler in all areas where members of the public are allowed to go. Additional information on this law can be found by using the scroll bar below. 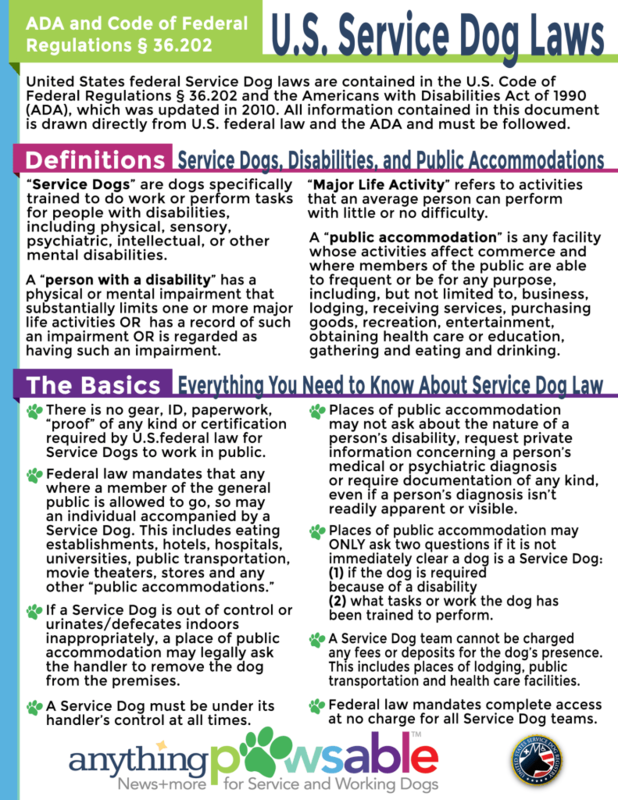 Additional info and resources can be found on our service dogs page. An emotional support animal is typically a pet that provides therapeutic support to their handler through companionship. If a doctor determines that a patient with a mental illness would benefit from an emotional support animal, the doctor can write letters of support to public housing and airlines so the animal can be allowed in “no pets” housing or in the cabin of a plane. The ADA considers emotional support animals to be distinctly different from PTSD and psychiatric service dogs. The ADA does not grant emotional support animals the same access to public places that it gives to individuals who use service, psychiatric or PTSD dogs to mitigate their disability. ​Many people find emotional support animals to be exactly what they need. They don’t have a need for the dog to perform a specific task. They just want the companionship a dog can provide. A pet dog or rescued dog can be used for emotional support. Although, under the ADA the dog doesn’t have public access, you can take it anywhere a pet dog can go. Often an emotional support animal is enough to get the handler out of the house and into more social settings. If you get a note from your doctor, the dog can be permitted to live in “no pets” housing, or accompany you in the cabin of a plane. But, because they don’t have public access they could not accompany you to restaurants, stores or other public places. One of the biggest benefits of going with an emotional support dog opposed to a service dog is there is no time factor. It often takes months to get a service dog, but an emotional support dog could be as easy as going to your local shelter and falling in love with a pet dog. It’s still highly recommended that you go to training classes with your dog to learn basic obedience. Asking a trainer to go with you to pick out a dog is also a good idea so he/she can do a temperament test to ensure the dog doesn’t have any behavioral issues that could interfere with your recovery. Additional info and resources can be found on our emotional support dogs page. Therapy Dogs do a valuable job by providing unconditional love, emotional support and an understanding, listening ear anywhere they’re needed. Many people are familiar with Therapy Dogs visiting hospitals, schools, universities group homes and libraries, but Therapy Dogs also provide a valuable service at funerals, disaster sites or anywhere else emotions, grief, and tension may run high. Therapy Dogs are typically well-trained, sweet-natured, friendly dogs who are, first and foremost, pets. Their family trains them and has them certified via a therapy organization, and therapy dog teams are most often volunteers. Therapy Dogs do NOT have public access, with or without their handler, and they may only enter buildings (that don’t allow all pets to enter) with a direct invitation to the dog and handler or to the therapy dog organization. Both Ricochet and Cori are registered therapy dogs with Alliance of Therapy Dogs, and certified goal-directed therapy dogs with ​Paws'itive Teams. A goal-directed therapy dog team (dog and handler) works with therapists and clinicians to determine what activities the dog and patient could do together as part of the patient's treatment plan. For instance, Ricochet works with the Naval Medical Center San Diego's Wounded, Ill and Injured program, and Paws'itive Teams Canine-inspired Community Re-integration program. The goal-directed therapy dogs in this program are handled by active duty service members with PTSD, TBI, MST or other injuries. The dogs owners facilitate the two hour session that meets once a week for six weeks with the Recreation Therapist from the hospital. The service members take the dogs into public places where pet dogs are allowed like Lowes, Home Depot, etc. Sometimes business owners will give the teams permission to train on their property. The service members learn to read their dog's body language which helps reduce their hypervigilance. In addition, the service members get a better idea of what a dog could do for them. Additional info and resources can be found on our therapy dogs page. Yes, even pet dogs can help PTSD. They obviously wouldn't have public access, but they could provide a lot of comfort at home or at venues that allow dogs. Dogs are hypervigilant by nature, so watching your dog's behavior can reduce your hypervigilance. If a dog isn't responding to their environment, there is no change in it, and nothing to worry about. If the environment changes, most dogs will display some type of behavior to let you know. It could be a simple ear flick, or the dog could actually change positions. If your dog isn't displaying any type of concern for the changed environment, you have nothing to worry about. Service dog tasks are easily validated by a specific cue the handler gives to the dog. Emotional support dogs perform instinctive behaviors and provide comfort without any cue given. ​Anything Pawsable describes a trained task as; a dog must execute a command (or behavior) promptly and on cue. Tasks are things that a dog is trained to do reliably — exactly like sitting or going into a down stay on command. Furthermore, the training must be verified by a qualitative and quantitative method (also known as proofing). Finally, and most importantly, the trained behavior in question must directly mitigate one or more aspects of the handler’s specific disability. The behavior of the dog must happen as a response to a specific command or be automatically cued by an external — but specific — factor such as scent (such as a verified sample of excretions from body during a high or low blood glucose level also known as hypoglycemia and hyperglycemia), emotion (such as a verified emotion of fear during a night terror), sound, motion, etc. ​Anything Pawsable goes on to say; there are no other requirements (no documentation, no gear, no certification, no registration, no anything else) for a dog to be a Service Dog, and it’s quite simple: if a dog is NOT task-trained, working directly for an individual with a disability and under the direct control of the handler, it is NOT a Service Dog. Turn on lights before veteran enters a room to reduce anxiety of entering a dark area. Sit or stand in front of veteran to create more personal space. Retrieve medication or other items. Sit or stand next to veteran, positioned so the dog is looking at what’s going on behind the veterans back. Sit or stand behind veteran to increase personal space. Wake veteran from nightmares and night terrors. Nudge, lick or paw the veteran to distract and re-direct their attention. Alert veteran when their anxiety increases. Circle the veteran in crowded areas to create more personal space. Lead handler to exit when they experience increased anxiety. Reduce anxiety by petting dog. Reduce social anxiety by taking dog to places pet dogs are allowed. Calm the handler during mood swings. Increase exercise by taking dog for a walk. The process of obtaining a service dog can be daunting. There are some excellent programs out there that provide PTSD service dogs. But, there’s also many more popping up every day that are questionable. The motives of these programs are admirable, but you want to make sure they are legitimate and experienced. There are also programs you want to stay away from. Sometimes when we’re in dire straits we don’t make the best decisions. And, getting a service dog is a major decision. Please use caution, and take your time. This is lifetime commitment and should be researched carefully. You want to make sure that the program you choose has the background, experience and training necessary to provide a highly trained dog for your specific needs. There is a high demand for PTSD service dogs, and quality is getting harder and harder to come by. The last thing you want is to face issues that will add to your stress. When you are matched with a dog, it should have had all the training necessary and be completely ready to work.